Yet another school event which is managed entirely by our fantastic PA. Mrs Sterling-Martin managed the whole process seamlessly and with minimal impact to the daily routine of the school. She modestly mentioned that she was very lucky to have had the experienced and extremely capable Mrs Bahl, Mrs Muir and Mrs Scott for guidance, leadership and support, as well as the other members of the Bazaar committee: Mrs Bahm, Mrs Longo, Mrs Shaikh and Mrs Radia. I thought that the school looked wonderful and everyone seemed to be having a fantastic time. I know how much time and effort went into organising the event and would like to extend my thanks to all the committee and parent reps for their behind the scenes hard work, their efforts did not go unnoticed and it was lovely to see all the girls having such a wonderful time. My personal thanks must go to the many parents who plied me with delicious food and drink, I was well looked after by you all! Thank you for all your hard work, Glendower is so lucky to have such committed parents. 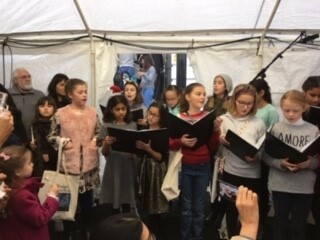 I would also like to mention the Y6 girls who sang the carols accompanied by Miss Fourie at the piano, it was a wonderful performance and definitely got the Christmas spirit going.